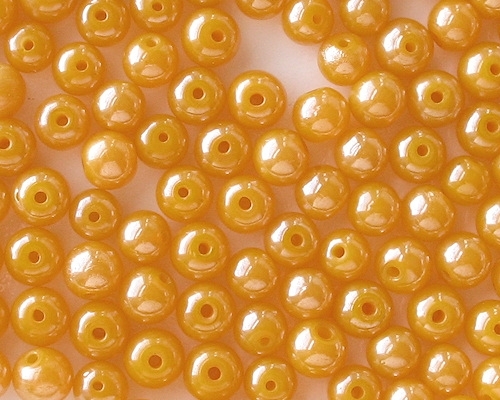 Size/shape: 7mm to 8mm round (spherical) beads. The beads vary slightly in size, and are also a little squat, meaning that they are slightly wider than they are long. 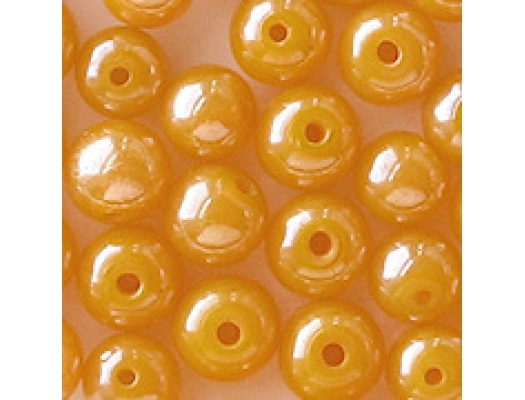 Colors/description: Bright milky yellow with a very shiny luster coating. Defects: These beads have fewer defects than Indian beads usually have (aside from the fact that they vary in size, which really isn't that much of a defect). 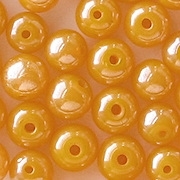 A few beads have pits or other anomalies around the holes. Also, I recently noticed that some beads have raised points on them. I am doing my best to eliminate those beads. Comments: Important: The picture makes the beads look almost orange. They are a deep yellow, but not orange. My picture was never completely accurate. Also, when I originally fixed up the picture, I had a CRT monitor. Now I have an LCD monitor, which reproduces colors slightly differently. You probably also have a CRT monitor. As I said above, the size ranges from 7mm to 8mm. In 2011 I indicated the size as 8mm-9mm. I believe that these are the same beads that I bought back then. However, they are slightly wider than they are long, and in 2011 I think I measured the width instead of the length. I am selling the beads in lots of 40 because the color is intense and some people don't want a full 50 of them.